1) (or Monk, or Le Moyne) (Potheridge, co. Devon; traced in Visit. Devon, 1620, seven generations before the reign of Edward I., and assigned a coat of eighty-eight quarterings; William Le Moyne, Esq., of Potheridge, living 3 Henry VI., 1424, had two sons, 1) John Le Moyne, his successor, and 2) Robert Le Moyne, from whom Viscount Monck, &c., in Ireland. The representation of this distinguished family, into which had married heiresses of Tilley, Estcott, Rishford, Trenchard, Crukerne, Grant, Champernowne, Wood, and Plantagenet, devolved, at the decease of Sir Thomas Monk, of Potheridge, upon his brother, George Monck, the celebrated Duke of Albemarle). Gu. a chev. betw. three lions’ heads erased ar. Crest—A cockatrice ar. 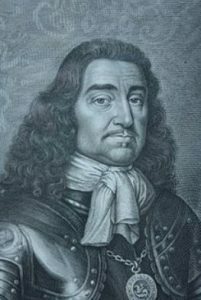 2) (Duke of Albemarle, extinct 1687; George Monck, or Monk, second son of Sir Thomas Monk, Knt., of Potheridge, was, for his exertions in bringing about the Restoration of Charles II., raised to the Peerage 1670). Same Arms. Crest—On a chapeau gu. turned up. erm. a cat-a-mountain statant guard, per pale sa. and ar. betw. two branches of olive vert Supporters—Dexter, a lion ar. ; sinister, a dragon ar. each supporting in the exterior paw a branch of olive vert. Motto—Fortiter, fideliter, foeliciter. 3) (Charleville, co. Wicklow; Charles Monck, Esq., of Grange Gorman, co. Dublin, descended from Robert le Moyne, second son of William Le Moyne, Esq., of Potheridge, 1424, m. 1705, Agneta, sister and heir of John Stephens, alias Hitchcock, Esq., of Charleville, and grand-dau. of Sir John Stephens, Knt., of Finglas, co. Dublin, and Charleville, and was father of a son and a dau., viz. : Henry Monck, Esq., of Charleville, whose only dau. and heir, Elizabeth, m. George, first Marquess of Waterford; and Anne, m. Henry Quin, Esq., M.D., and had a dau., Аnn Quin, m. her cousin, Charles Stanley Monck, afterwards first Viscount Monck). Same Arms. Crest—A dragon, wings elevated sa. Motto, same as last. 4) (Viscount Monck; Charles Stanley Monck, Esq. cousin and heir male of Henry Monck, Esq., of Charleville, was Crested, 1797, Baron Monck, and was raised to a Viscounty 1800. Same Arms and Crest. Supporters— Dexter, a dragon; sinister, a lion, both ar. gorged with an oak branch ppr. Motlo—Fortiter, fideliter, feliciter. 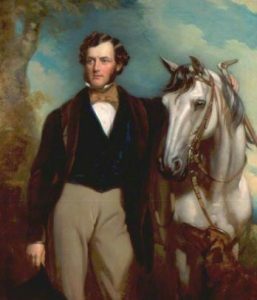 5) (Earl of Rathdown, extinct 1848; Henry Stanley, second Viscount Monck, was created an earl 1822, d.s.p.m). Same Arms, Crest, Supporters, and Motto. 6) (Coley Park, co. Berks; descended from William Monck, brother of Charles Monck, Esq., of Charleville, 1706). Same Arms, Crest, and Motto. 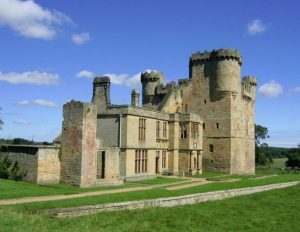 7) (Belsay Castle, со. Northumberland, bart. ; Sir William Middleton, fifth bart. 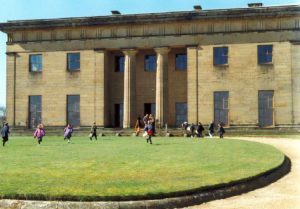 of Belsay, m. Jane, dau. And heir of Lawrence Monck, Esq., of Caenby, co. Lincoln; their son, the sixth bart., assumed the name and aims of Monck, 1799). Ar. a chev. chequy or and sa. betw. three leopards’ heads erased az. collared and lined gold. Crest—Upon a mount vert a demi griffin couchant couped ar. 8) (Newcastle-on Tyne). Az. a lion ramp. erm. 9) (Newton, near Drogheda, co. Louth; Fun. Ent. Ulster’s Office, 1620, Edward Moncke, Esq., of that place). Gu. a chev. betw. three lions’ heads erased ar. a martlet for diff. 10) (Lingard-Monk, Fulshaw, co. Chester, 1883). Quarterly: 1st, counter-quartered, 1st and 4th, ar. a pale gu. over all a chev. engr. betw. three lions’ heads erased, all counterchanged, for Monk; 2nd and 3rd, barry of six or and vair, on a bend cottised sa. three escallops ar., for Lingard; 2nd, sa. a quadrangular castle ar. betw. two flaunches of the second each charged with a garb of the field, for Rowson; 3rd, erm. six stags’ heads cabossed gu. three, two, and one, for Boughey; 4th, or, three chevronels engr. betw. three plummets az., for Jennings. Crests—1st, Monk: A dragon passant per pale gu. and ar. wings vairee of the same supporting with its dexter claw an escutcheon ar. charged with a lion’s head erased gu. ; Motto over—Tout d’en haut. 2nd, Lingrd: A wolf’s head erased sa. charged with an escallop and holding in the mouth a cross crosslet fitchee both ar. Motto over—Toujours prest. 11) (Lingard-Monk, Broome House, co. Lancaster; exemplified to Richard Boughey Monk Lingard, Esq., of Heaton Norris, co. Lancaster, eldest son of Roger Rowson Lingard, of the latter place, and of Milgate, co. Chester, by Mary Monk, his second wife, dau. of Rev. George Monk, of St. Paul’s, Liverpool, and sister and heir of Rev. John Boughey Monk, Fellow of Trin. 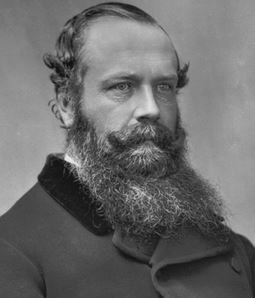 Coll., Cam., upon his assuming, by royal licence, 1875, the additional surname of Monk). 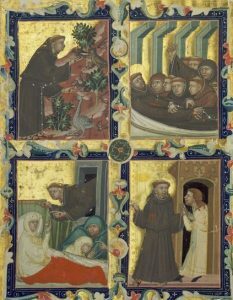 Quarterly, 1st and 6th, Monk and Lixgard, quarterly, 1st and 4th, Monk, gu. a chev. dovetailed betw. four lions’ heads erased, three in chief and one in base ar., 2nd and 3rd, Lingard, barry of six or and vair, on a bend engr. sa. four escallops ar. ; 2nd, Rowson, quarterly, az. and sa. a quadrangular castle with four towers ppr. betw. two flaunches ar. each charged with an annulet gu. ; 3rd, Monk, gu. a chev. dovetailed betw. four lions’ heads erased, three in chief and one in base ar. ; 4th, Boughey, erm. three crosses pattee chevronwise gu. betw. as many stags’ heads erased and affrontee sa. ; 5th, Jennings, or, a chev. az. betw. in chief two plummets of the last and in base a saltire gu. Crests—1st, Monk: A dragon sa. charged on the wing with a cross pattee or, resting the dexter claw on an escocheon gu. thereon a lion’s head erased gold; 2nd, Lingard: A wolfs head erased sa. charged with an escallop or, holding in the mouth three cinquefoils slipped vert. Motto—Tout d’en haut. This is most likely an Anglo-Saxon name, brought to England following the Noman conquest of 1066. It is generally agreed that the Monck/Moncke/Monk name is occupational, deriving from the monks of monasteries. The word ‘monk’ is said to mean a recluse and comes from the pre 7th century word ‘munuc’, which was originally used to describe a servant of a monastery, and later changed to its modern use. Its use as a surname likely came from it being a nickname for someone who looked like a monk; led a solitary, religious life; or played the part of a monk in a travelling theatre production. Barber’s ‘British Family Names…’, published in 1894, states that Monk comes from the Old Norse nickname ‘Munki’; the Danish name Munck; the Dutch names Monch, Monk and Munk; and the French personal name Moncq. Arthur’s ‘An Etymological Dictionary…’, published in 1857, states that Monk is derived from the Greek ‘μóvoç’; the Welsh ‘mon’, meaning sole, separate or alone; and the Gaelic ‘moanach’, meaning a man who devotes himself entirely to religion, leaving the ordinary concerns of the world behind. The name is commonly traced back to Devon in England, where the Monks held a family seat as Lords of the Manor of Potheridge, and were reportedly descended from Le Moyne, a Norman noble who attended Duke William at the Battle of Hastings. Guppy’s ‘Homes of Family Names in Great Britian’, published in 1890, records Monk families in Buckinghamshire, Kent, Lancashire and Northamptonshire, noting that the name is sometimes spelt Munk in the Kent area. Lower’s ‘English Surnames…’ tells a tale of a court case in Huntingdon in 1619. 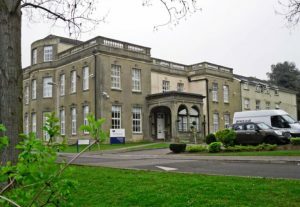 The presiding Judge had criticised the sheriff for his poor choice of members of the jury in the previous case, considering them of too low a social rank to serve. The sheriff responded by selecting a jury purely comprised of people with dignified surnames including amongst others a Maximilian King of Toseland, a Stephen Pope of Newton , a John Archdeacon of Paxton and a Henry Monk of Stukeley. Black’s ‘The Surnames of Scotland’, published in 1946, states that there are a number of Monk families on the islands of Benbecula and North Uist, and that the name is an Anglican form of MacManachan. The first known recording of any variation of the name belongs to Aylric Munec, who was recorded in the ‘Anglo-Saxon Wills’ register of 1045, during the reign of King Edward ‘The Confessor’ of England. Direct variations of the Monk name which share the same origin include Munk, Munck, Monck, Moncke, Monks, Moncks, Monke, Monckes and Monnick. Similar names which could share an origin include, but are not limited to, the following: Monku, Monek, Monak, Monki, Monok, Monko, Monik, and Monka. In Ireland the name is changed to Minogue or Managhan. Some 25,520 people bear the name Monk, making it the 14,825th most popular surname in the world. 13,650 of them live in the USA, mostly in Texas, where one in every 14,146 people is a Monk. In Britian, where the name originated, there are some 5,000 Monks, mostly spread over Lancashire, Greater Manchester and County Down, were it is the 88th most popular surname. There are some 1,074 people bearing the name Monck, making it the 283,665th most popular surname in the world. It is most frequent in Australia, where one in every 65,100 people is a Monck. The ‘Hundred Rolls’ census of 1273 records a William le Monek. A John Monachus was recorded a rendering homage at Berwick in 1291. One Peter le Monek is recorded in the ‘Writs of Parliament’ of 1300. The 1379 ‘Poll Tax of Yorkshire’ lists a Johannes and Agnes Mounke, and a Willelmus and Alicia Mounke. One John Mounk became burgess of Aberdeen in 1486. One Annas Munk/Munke was suspected of witchcraft in Dysart in 1626. A William Worslye and Agnes Monke were recorded as married at the St. James church in Clerkenwell in 1638. George, Duke of Albemarle, whose full title ‘Georgius Monke, Dux de Albemarle’ is an imperfect anagram of ‘Ego Regem reduxi, Ano. Sa. MDCLVV’ or ‘I brought back the King in the year 1660’, and indeed, he was a key figure in the Restoration of the Monarchy to King Charles II. The Monck family motto is ‘fortiter, fideliter, feliciter’ which translates as ‘boldly, faithfully, successfully’. Burke’s ‘A Genealogical and Heraldic History…’ discusses one branch of the Monck name, Monck of Coley Park. He states that one William Monke, third son of Henry Moncke Esquire, was baptised in 1692. He married Dorothy, sister of John, 1st Earl of Darnley and passed his name to his son John Monck Esquire of Bath. John married Emily Snee and had, amongst other issue, George, John and Emilia. Their son John Berkeley Monck Esquire became a barrister and purchased the estate at Coley amongst others in Reading, eventually becoming a member of parliament there. He married Mary Stephens in 1810 and they had the following issue: John Bligh, William Stanley, Emilia and Mariette. His son John Bligh Monck Esquire of Coley Park, Berkshire, was born in 1811, married Elizabeth Margaret in 1841, and became a High Sheriff in 1845. He and Elizabeth had the following issue: William Berkeley, John Stanley, George Gustavus, Charlotte Emily Margaret, Mary Louisa and Frances Elizabeth. One Thomas Monck was born around 1515 in Ashwater, Devon. He married Frances Plantagenet around 1542 and they had the following issue: Katherine, Anthony, John, Margaret, Mary (Arscott), Francis, Thomas and Frances (Stucley). Their son Anthony Monck was born in 1542 in Potheridge, married Mary Arscott, and fathered Sir Thomas Monck in 1570. Sir Thomas fathered George, Thomas and Nicholas, and his son Reverend Nicholas Monck, Bishop of Hereford and Provost of Eton, died on the 7th of December 1661. His son George Monck, Duke of Albemarle, is discussed above in the ‘Early Bearers’ section. One John Monk was born in 1624 in Manchester, England, and fathered a son, John, in 1650. John Monk married Joanne English and fathered another John Monk in 1672. This John married Ann Davies and fathered William Monk in 1692. William married Mary Andrews and they had a son, William, in 1717. William Monk married Ann Carter and had his own son William in 1752. William married Sarah Newman and they had a daughter, Sarah Islington Monk (Kelly) in 1800. William Monk died in 1832 in Hampshire. One Peter Monk travelled to Barbados in January 1634, at 29 years old. One Edward Monk was recorded as landing in Maryland in 1662, and one Henry Monk followed close behind in 1668. One Henry Monk was recorded on the 22nd of December 1679 in the parish register of Christ Church in Barbados as owning two acres of land and two slaves. One Christopher Monk, a mariner, was recorded as settling in Boston. He and his wife Mary had five children: Christopher, born in 1686; Thomas, in 1690; Ebenezer, in 1692; Susanna, in 1696; and Mary in 1700. One George Monk, a wine merchant at the ‘Sign of the Blue Anchor’ was also recorded settling in Boston. He and his wife Lucy had two children: George, born in 1683; and William, in 1686. We have eight coats of arms for the Monck surname depicted here, as well as one for Moncke and two for Monk. These blazons are from Bernard Burke’s book ‘The General Armory…’, which was published in 1884. The bottom of this page contains the blazons, and in many instances some historical, geographical, and genealogical information about where the coat of arms was found and who bore it. We also have one coat of arms for the Monke surname. This blazon is listed in Joseph Foster’s book ‘Grantees of Arms Named in Docquets and Patents to the End of the Seventeenth Century’, which was published in 1915. The coat of arms was awarded to John Monke of Hurston in 1615.
Notable people throughout history bearing the name Monck include, but are not limited to, the following: William Henry Stanley Monck (1839 – 1915), an Irish astronomer and philosopher who was elected to the Royal Astronomical Society in 1899; Charles Monck, 4th Viscount Monck (1819 – 1894), the first Governor General of Canada after Canadian Confederation; and Edward Herbert Beresford ‘Chip’ Monck (1939 – present), the Tony Award nominated lighting designer who served as master of ceremonies at Woodstock in 1969.
Notable people throughout history bearing the name Monk include, but are not limited to, the following: William Henry Monk (1823 – 1889), an English musician who composed popular Christian hymns; Henry Wentworth Monk (1827 – 1896) a Canadian mystic who reportedly predicted the formation of the UN and both World Wars; and Hank Monk, a legendary stagecoach driver who drove between Nevada and California in the 1870s and is mentioned in Mark Twain’s ‘Roughing It’.